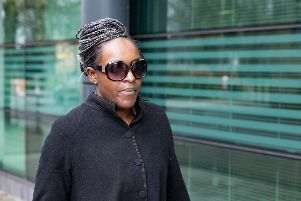 A woman who worked for Peterborough MP Fiona Onasanya told a tribunal the MP should have picked another office space for her constituency base as the one she selected was unsuitable for disabled people. Jan Goodenough, who worked as a case worker for Ms Onasanya in 2017, told a hearing at Cambridge County Court the office at the Eco Innovation Centre in Peterborough only had one lift, and the first floor office did not have ladies toilets. Ms Goodenough, who says she was discriminated against by Ms Onasanya on the grounds of her disabilities, suffers from arthritis, IBS and chronic fatigue syndrome, and says the toilets were too far away from the office..
She also said she had been promised flexible part-time working when she started in her role, but was later told she had to be at the office on Mondays and Tuesdays between 9am and 5pm. Ms Goodenough, who is representing herself, told the hearing she was never told why the office had been chosen. She said: “I presume it fits in with a modern mindset of being eco-friendly and forward thinking. Stuart Brittenden, representing Ms Onasanya, suggested Ms Goodenough had refused to work in a downstairs meeting room, closer to toilets. The hearing heard Ms Goodenough had been told she could use the male toilets - but Rob Grayston, the constituency manager at the time, told the hearing it had been done in a ‘flippant’ manner. Ms Goodenough told the hearing she had had disagreement with Ms Onasanya when she corrected the then Labour MP’s pronunciation of words. She said she had told Ms Onasanya she was mispronouncing eligible and illegible. Ms Goodenough told the hearing she had not done so in front of a constituent - and was later told she had to work 9-5 Monday and Tuesday. Ms Goodenough handed her resignation in on November 7 - and on November 8 wrote to Ms Onasanya to explain why she had done so - and she was asked by Mr Brittenden if she had hoped Ms Onasanya could have done something about the problems. Ms Onasanya denies discrimination. The hearing continues.